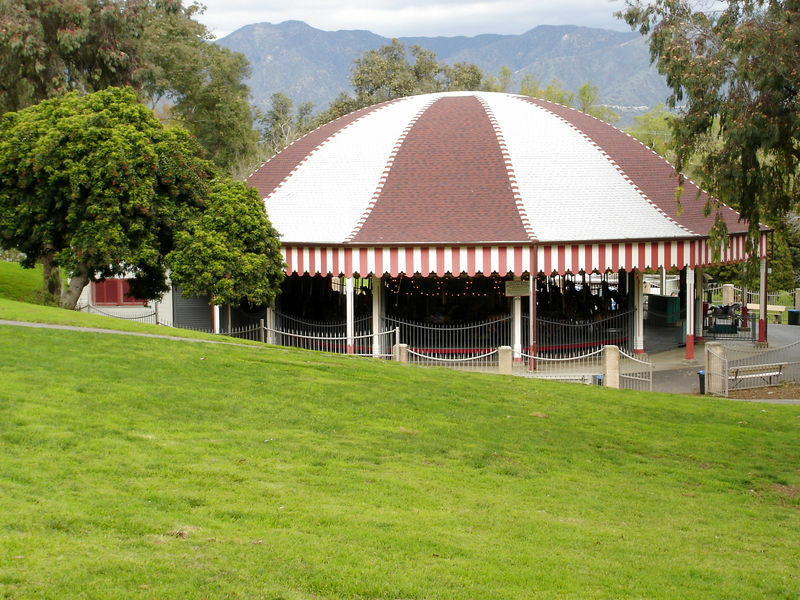 The Griffith Park Merry Go Round was built in 1926 and moved to Griffith Park in 1937 where it has operated ever since. Griffith Park is a huge sprawling public park north of Los Angeles - they also have a train ride, pony rides, and a famous observatory. This Merry Go Round (it is not referred to as a carousel) is a rare Herschell-Spillman machine with it's original horses. Unlike other H-S machines which often have a menegarie of animals or are mixed machines (horses by various makers) - this machine is strictly horses and spectacular ones at that. The Merry Go Round is in the process of receiving a long, loving restoration that it is thankfully operating through. Looking down the hillside at the Merry Go Round.